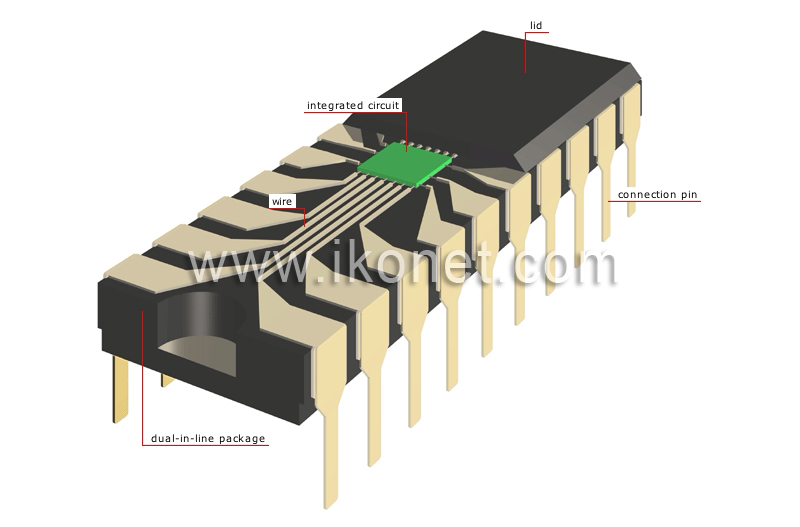 Integrated circuits are used especially in microprocessors, stereo equipment, calculators, watches and electronic games. Cover that protects the integrated circuit in its package. Miniature electronic circuit made up of a large number of components (such as transistors and capacitors); it is created on a semiconducting wafer usually made of silicon. Conductive element that connects the circuit components to a connection pin. Most common type of package currently in use for integrated circuits; it usually has between eight and 48 pins, which are evenly distributed along each side of the package. Metal part that connects the integrated circuit package with the metal bands of the printed circuit to which it is soldered.